Ready to elevate your stretching beyond the standard bend and reach? And to achieve toned muscles and pain reduction while you do it? Creator Anna Rahe’s GST (Grace Somatomorphic Technique) takes a unique approach to long-term body transformation based in traction stretching. Unlike traditional workouts, the constantly evolving routine is geared toward manipulating the fascia (connective tissue) through targeted movements. Try GST as a complement to an existing fitness routine, or a stand alone method to transform the body. Classes Offered: GST Praxis, AAA Workout, GST Stretch, GST Bodyworx, Body Barre, Bodyworx/Stretch, Excelerate. Private bodyworks sessions are also available. Why You Should Check It Out: When it comes to stretching, GST elevates the exercise far beyond touching your toes. The method focuses on five GST Somatiques: Spinocoretilation (core exercise), Musculoanimorphics (muscle training), Osteotectonics (bone stability), Oxyllation (breath control) and Dermatraction (manipulation of the fascia - or connective tissue - to create long-term body transformation), together with GST Calescenics (a spring and bar-based exercise movements). Each hour-long workout incorporates resistance springs that enhance a thorough stretch of all areas of the body, and promote muscle toning. The technique, which is built for fitness novices and seasoned athletes alike, is all about creating long, lean muscles. This is not a workout for “quick fix” seekers, however. GST Body takes a long-term approach to pain reduction and body transformation. 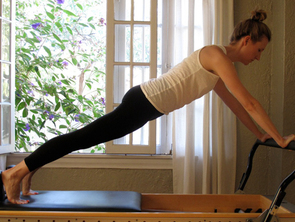 Know Before You Go: All equipment is provided by the studio, and classes are performed barefoot. Parking is located in a lot behind the studio; street parking is also available in the surrounding neighborhood. Advice for first timers: Classes are broken into level 1, level 2 and mixed. While no prerequisite is required for mixed or level 2 classes, beginning with level one is highly recommended to learn the basics of the technique.